There is no possible way to claim that this cream cheese Alfredo sauce is remotely good for you. But hey, it’s got peas! More importantly, it’s packed with crispy, delicious bacon and even better — the cream cheese sauce that hugs the fettuccine noodles is rich and thick and hearty and so indulgent! I made this easy pasta dish for supper last night and we really enjoyed it — even Chris’s brother-in-law liked the sauce. He had helped Chris go flatbed our truck home from 30 miles away and they arrived back just as I was putting supper on the table. This is the second time in a week that Chris’s work truck has broke down on the way home form the job site. The first time, it was the motor and he had to buy a new one and pay to have someone put it in since we don’t have a garage here. Now, there’s a broken flywheel thingy-ma-jig which will be a pain to replace. Our week has been eventful to say the least, so a big bowl of pasta with cream cheese Alfredo sauce was just the ticket for a comforting family meal. 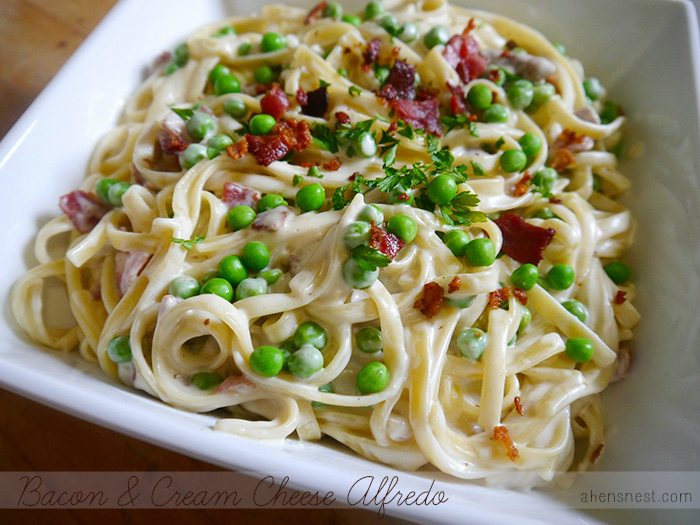 Try this indulgent cream cheese Alfredo sauce that is packed with delicious with crispy bacon and frozen peas for a hearty satisfying meal. Cook noodles al dente, according to package instructions. Add peas to boiling pasta during the last minute of cook time. Drain. Meanwhile, in dutch oven, melt butter over med-high heat. Add softened cream cheese and whisk until smooth. Slowly add milk, while continuing to whisk until lumps are gone. Add Parmesan, garlic powder and pepper. Stir until sauce is desired consistency. Add hot noodles, peas ½ the parsley and bacon to cream cheese mixture. Toss until noodles are evenly coated. Pour into serving bowl and garnish top with remaining parsley. • If sauce is too thick, stir in a bit more milk before adding noodles. 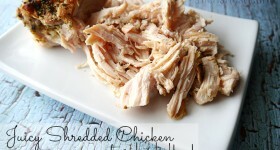 • The recipe can be halved for a family of 4, we had a ton of leftovers! Sounds delicious, I’m a huge alfredo fan. And bacon too? Yum! I’d have to omit the peas though or my husband and son wouldn’t even try it. It would be good without them, too! I am thinking of making it with some broccoli or even frozen green beans next time! This looks delicious! I love that you added peas, my kids would adore this! No way this wouldn’t be a hit in my house. Pinning it! I need to add to the post that this was AMAZING the next day as leftovers! We just added a splash of milk and reheated in the microwave — it was almost better than the first day! I hope you like it if you try it! Oh man, can I come to your house for dinner the next time you make this? This looks YUMMY! A friend of mine gave me an unbelievable amount of pasta because her and her family are no longer going to eat pasta (I’m talking about 20 boxes or more :) So this is just the recipe I needed. Sorry about the truck problems. Hope everything gets better soon. This is one of my all-time favorite dishes, but I never make it b/c it seems so hard (so many restaurants manage to mess it up). But this actually sounds doable. I think you have inspired me. You had me at bacon…no seriously, you did LOL!